Is there any way to make tater tots good for you? And with my discovery of these Garlic-Lime Mini Sweet Potato Puffs, I am happy to say that the answer is YES! 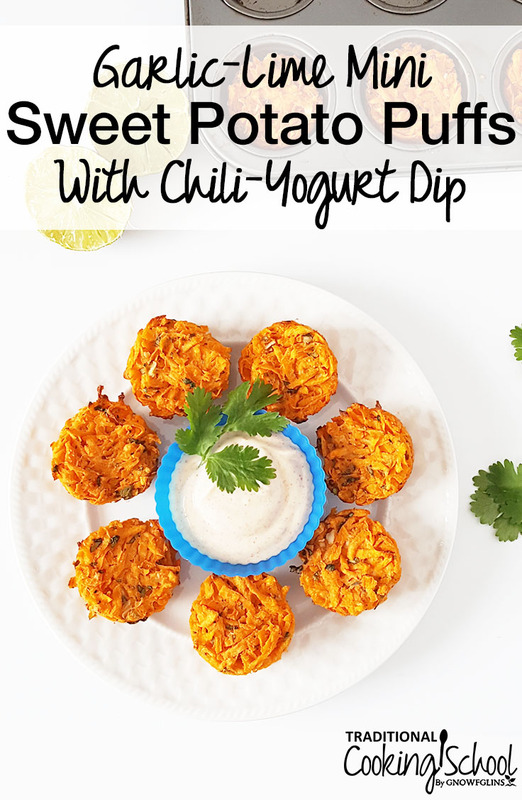 These easy-to-make sweet potato puffs are infused with garlic, lime, and cilantro and paired with a probiotic chili-yogurt dipping sauce. YUM! Think cilantro tastes like soap? There are actually people who are genetically predisposed to think this (source)! If you're one of them, feel free to leave it out or substitute with your favorite dark leafy green or herb. Trim Healthy Mama? These sweet potato puffs easily work on-plan with only a few tweaks (see recipe for details). The MCT oil in the recipe is optional, but for maximum Vitamin A absorption be sure to have your added fat grams with this meal! 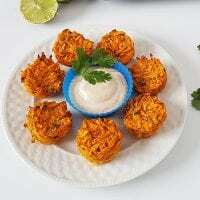 These Sweet Potato Puffs make a terrific side dish for an Energizing meal of baked chicken breast or lean fish, and steamed green veggies or salad. Is there any way to make tater tots good for you? With these grain-free Garlic-Lime Mini Sweet Potato Puffs, the answer is YES! These make an easy and nourishing appetizer, side dish, or snack, and the chili-yogurt dipping sauce is a delicious way to get extra probiotics into your meal. Using a pizza cutter, finely chop cilantro leaves. Combine cilantro, shredded sweet potatoes, onion, garlic, lime juice, egg, sea salt, and pepper in a mixing bowl. Mix well. Lightly grease the wells of a 12-hole mini muffin pan. Divide the sweet potato mixture evenly into the wells, packing the mixture down so it's flush with the pan. A small cookie scoop works well -- 1 heaping scoop per mini muffin well. Bake for 35 to 40 minutes, or until firm and lightly brown on top. Allow to cool for several minutes before gently removing from the pan. It may be helpful to run a butter knife or other thin utensil around the edge of each muffin to loosen them. Serve with dipping sauce (below). Enjoy! This recipe easily doubles or triples. Store in the fridge for quick snacks and meals, then reheat. While puffs are baking, combine yogurt, MCT oil (if using), chili powder, and sea salt in a small bowl. Are there any recipes that you'd like to transform from highly-processed to nutrient-dense? Follow these steps! First, make it yourself, from scratch. This way, you'll control the ingredients! No preservatives, dyes, or anything you can't pronounce. Choose fresh, whole, nutrient-dense ingredients. For example, tater tots are typically made with white potatoes — yet sweet potatoes contain much more Vitamin A, Vitamin C, and fiber. White potatoes are also part of the nightshade family, which can cause inflammation in some people and interestingly, contain a lectin structurally similar to wheat (source). So, I went with sweet potatoes for my tater tots! Include your kids! Do you have any picky eaters in your household? They're much more likely to eat what's on their plate if they helped make it! Finally, add a little love. 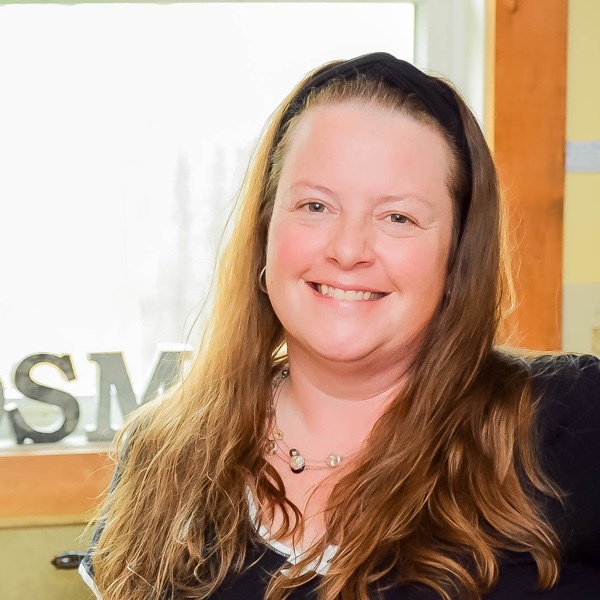 When I serve my kids homemade food, I always say, “I put extra love in it, can you tell?” Now they expect extra love in everything, and if they think I've forgotten, they'll take a little pinch from their heart and “sprinkle” it in the pot. Of course that always makes it taste better! Are you a fan of cilantro? Will you add it to your Mini Sweet Potato Puffs or leave it out? Fun and fantastic recipe – not to mention, yummy. I have it down to make as an additional finger-food tradition for our Christmas Eve gathering. Thank you, Dawn! I see that it makes 12 puffs. Is one puff equal to one serving? I look forward to trying this and it looks and sounds delish!